My favorite pick of DC’s 52 keeps on rolling with the usual quality business from Milligan and Janin. 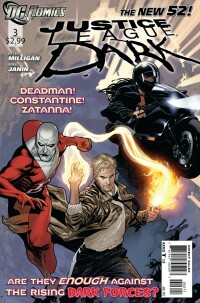 The creepiness, the other worldliness of this book is the primary strength of the title and here in issue #3, Justice League Dark maintains its own status quo: Zatanna is in need of some TLC, seeing that she’s seated in the middle of Main Street USA in a self-imposed trance, a defensive move to counter the Enchantress’ attacks while the witch sets up a magical equivalent of a box trap in the boonies to await her prey. The only guy who can lend Zatanna a hand is one John Constantine, and when that guy’s your guiding light…well, you know you just fell from the frying pan and into the fire, figuratively speaking. Meanwhile, June Moone and Deadman are off trying to figure out the nuts n’ bolts of their own relationship as Shade tries vainly to contact other “magick” folks at the request of Xanadu in a fruitless recruitment process. At least we DO get to see a potential new teammate that I can’t name here, ‘cause where’d be your incentive to treat yourself to this title if I did? Know this: I like Deadman. I’m glad he’s being used in this book and used wisely. Issue #3 gives me plenty of Deadman, so if you’re a Deadie, you’ll be a happy little reader come the final page since we’re promised more of the Big Red D next month. No doubt Milligan’s on task this issue, the same as he’s been the previous two months, and Janin’s penciling is A- grade as always so there’s no concern in either department. Where’s the beef? With DC’s brass, that’s where. Seems to be a lot of cuts happening around the main office, with creators being dropped or reassigned or what have you, so here’s my message to DC’s top dawgs concerning this title: Don’t fix it if it ain’t broke. Milligan and Janin are peanut butter and jelly, the driving force that go well together, a team with a story to tell and that creative energy trickles down and up the ladder to everyone working on this book, so if you’re kicking around pink-slipping anybody on the team, don’t—these pieces fit too well together. I’ve said it before: Justice League Dark is the cure for what ails you—as long as humdrum storytelling and run-of-the-mill art is your poison.